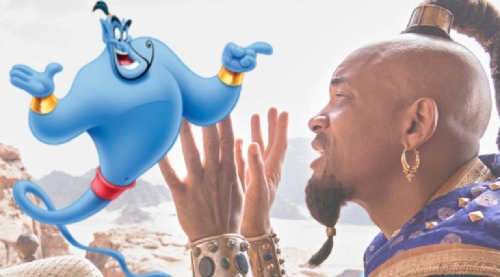 While Entertainment Weekly‘s preview of the live-action Aladdin remake showed off Will Smith at the Genie in his human disguise (pictured above, right), the original, blue form of Genie (pictured above, left) has yet to be revealed… Until now. A new TV spot ends with our first look at the Hollywood star turning into a blue, semi-digital magical being as he emerges from the lamp. So far, I’ve been seeing some… mixed reactions to Genie’s appearance here, but I just don’t get where they’re coming from. 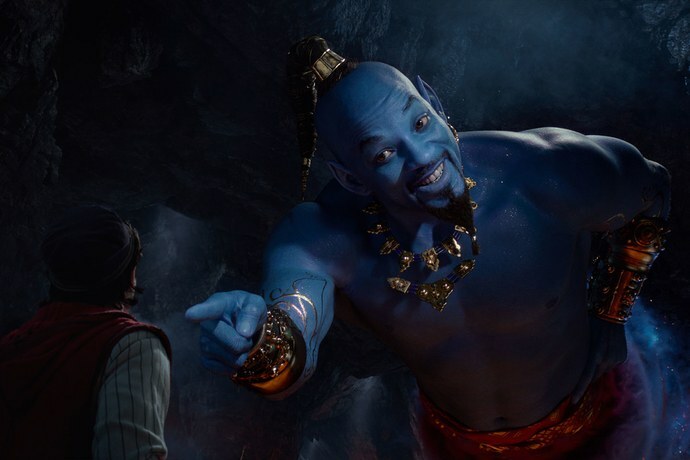 It looks like a big, blue version of Will Smith. Really, what did they expect? At least he looks better in an image with finished CGI, which Disney released shortly after the trailer dropped. Beyond that, I have to say that I really like the set design and costuming for all of this. Even though I don’t feel that Disney needs to keep doing live-action remakes of their best movies to be successful, it seems like they’re definitely putting the effort into bringing these worlds back to life as opposed to simply cashing in on existing IP.